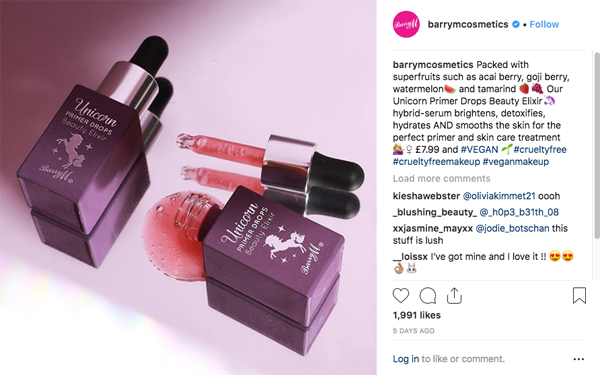 Cruelty-free British cosmetics brand Barry M has launched a new vegan primer ‘packed with superfruits’. For all the unicorn fans out there, Barry M’s new primer comes in a sparkly purple and silver bottle. It is oil-free and made with watermelon, tamarind, acai berries and goji berries. True to the vibrant nature of the make-up company, the drops are fruity red in colour. According to an Instagram post by Barry M, the Unicorn Drops prime, brighten and hydrate your skin. Other make-up brands have used the smoothing and hydrating properties of ‘superfruits’ in their primers. For instance, Italian brand Farsali’s ‘Unicorn Essence’ also uses them to ‘solve a catalogue of common complexion concerns’. Their product can be bought for £20.00 whereas Barry M’s primer is £7.99. Barry M continues to launch new vegan-friendly, cruelty-free products at an admirable rate. The company has been cruelty-free since its foundation in 1982, supports Humane Society International’s Be Cruelty Free campaign and has recently pledged to stop selling products in China, where animal testing is unavoidable. Find the new Unicorn Primer Drops here.